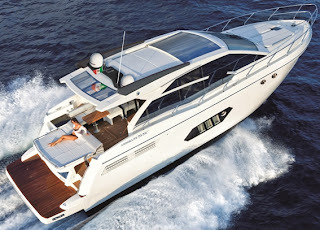 A further evolution of the 53 STY this in synthesis the Absolute 55 STY, but the yacht apart having that extra ten centimeters in length offers much more then you think it is possible. This happens because Absolute Research Lab revisit all the interior, and also the exterior layout by moving the galley on top and in the much praised astern position, thus reinventing and creating more space also below deck. Thanks to this the 55 STY features a lower deck with a midships full beam owners stateroom, a VIP to fore, and a double guest cabin to starboard. The aft deck of the 55 STY has also been reinvented now offering a sun pad, and a medium sized L-shaped settee to port side. The 55 STY also offers more power options versus the 53 being offering with twin Volvo 600 and 700hp units alongside the two or three 435hp choices as offered in the smaller sister.